In this photo you can see all of the details in this little guy’s eyes. You can see all of the hairs on his (or her) body, and some of the hairs on the legs. You can also see the detailed pattern on it’s wings. It’s not often we get close to a critter like this. A picture is always helpful to exploring the details. My first instinct was to take my camera outside and look up at the sky until I found something to take a picture of. The only problem with that is that it’s about 10,000 degrees Kelvin outside, and I don’t want to put my body or my camera through that. So I settled in, with the air conditioning blasting, to look for an older picture that fit this prompt. I actually found one rather quickly. It’s one I’ve been holding on to for a while, waiting to use. It’s not a particularly spectacular picture, I just think it’s interesting. For this prompt, I had many photos in mind. I made a short list of the photos in my archives that I would consider using for this challenge, but I erased the whole thing when I came across this one. It was just too cute not to share. Here is a photo I’ve posted a few times. It’s from an early snow storm a few years ago. I think the contrast in seasons portrayed is quite interesting. Lots of things happen beneath your feet that you don’t even realize. How often do we step on things that we didn’t even know were there? There are thousands, probably millions or billions of tiny organisms under our feet every time we take a step. There are also lots of buried things deep in the ground beneath us that we don’t give a second thought to. Foggy is very similar to humid in my mind. It took some planning ahead to choose photos that represented each accurately. Here is my contribution to this week’s challenge. For me, Inspiration comes from lot of things, and sometimes from nothing. Sometimes, a thought just pops into my head, and I spend some time with it. Other times, I have to spend some time thinking, before I get that spark. Usually spending time alone, in a quiet place, helps with that. I don’t live near the ocean, so most of the time, deep into the woods is where I go. But on the occasion that I am near the beach, spending some time alone on the rocks can be pretty inspiring. One thing that I always love to snap a photo of is flowers. Mostly because flowers usually have bright colors, but also because sometimes, they have small details that are actually really cool. 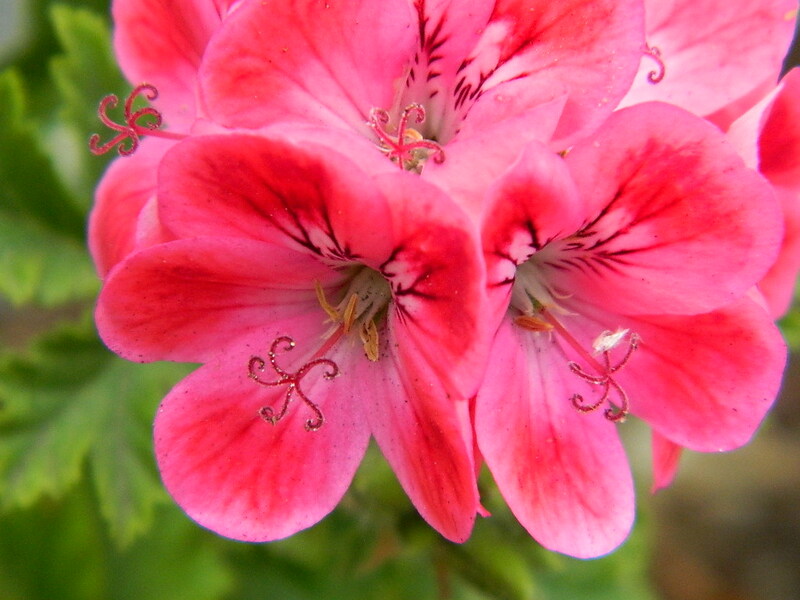 Look at the stigma (the curly bit) of these flowers! Just walking by, you wouldn’t even notice. But if you get up close, you see the tiny details, and those are usually the best part. I never get tired of photographing flowers because each one is so unique! A few years ago, we got an early snowfall in October. 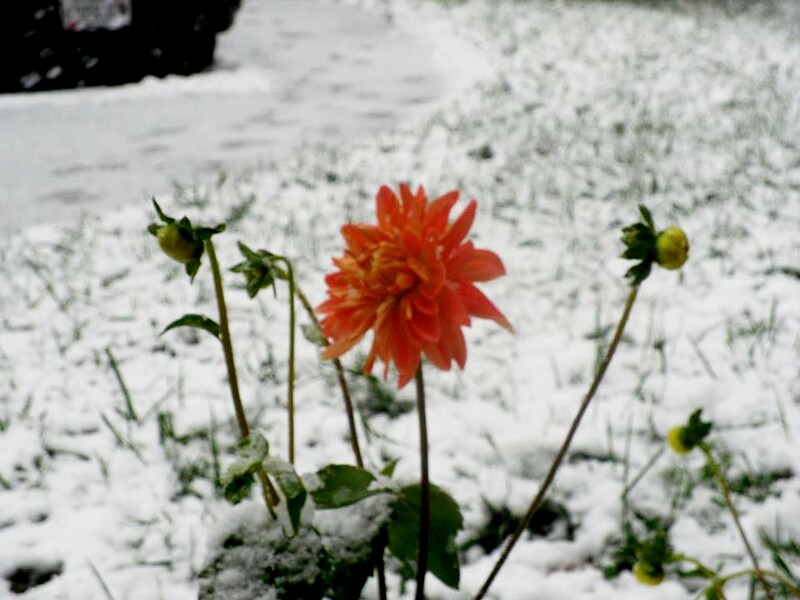 This flower wasn’t quite ready for the surprise snow. Some of those flowers look like they hadn’t even bloomed yet! I guess you could say the snow was a little off-season.